In 1946, following the end of World War ll, technicians and drafted workers from the Optical Department of the Toyokawa Naval Arsenal combined their collective advanced technical skills and established the Optical Product Division at Kowa. The TS-1 and TS-2 spotting scopes were the first spotting scopes produced by Kowa. The TS-1 was used extensively during the Tokyo Olympics in 1964. The TS-3 employed a helicoid system in which the focus was set by rotating the eyepiece prism. The TS-4 was an angled 50mm spotting scope that made the TS-1 smaller and more compact. Kowa developed the inner lens focusing technique which used a focusing lens that was placed immediately in front of the prism. This made the 60mm spotting scope as light and compact as the 50mm TS-4. The TS-7 was the only Kowa spotting scope to use a Dach prism system. This model was not sold in Japan and was mainly exported to Europe and North America. The ultra-short bodied TS-8 which had a total length of only 208mm was released under the TS-M name, and became popularly known as the “Mini-Spo”, an abbreviation of "mini-spotting scope". This was the only Kowa scope in which focus adjustment was carried out by moving the objective lens through rotating a focus ring that shared the same axis as the lens tube. The motivation behind the development of the TSN (telescope new)　scopes was "to create spotting scopes that had the world's best viewing characteristics". These scopes utilized all the knowledge that had been gathered from years of innovative design and development. The results were the TSN 1 and 2 models which included objective lenses that were larger than the 50mm and 60mm objective diameters of the TS line. The new products were named TSN (TeleScope New) and were the first of a new category of spotting scopes. Future models inheriting the TSN name were only those with lens aperture diameters of 82mm and 66mm that had not previously been released. The TSN 3 and 4 PROMINAR models incorporated pure fluorite crystal objective lenses which delivered the brightest, sharpest, and clearest images compared to any other spotting scopes. Even though fluorite is an ideal lens type which has extremely low chromatic aberration (color fringing that appears on the periphery of the images), it is crystal instead of glass and is more difficult to process and polish and is, therefore, more expensive. However, fluorite lenses had to be used to deliver "the world's best viewing characteristics". The TSN 3 and 4 models were the first to have PROMINAR printed on the scope body which had previously been used only as a descriptive name. The TS 601 and 602 were developed as basic model spotting scopes. Their proven performance and function, sturdy bodies, and reasonable pricecreated high demand in the worldwide nature viewing market. The TSN-820 Series were designed with an 82mm objective lens which　increased light gathering and improved resolution. Since the body was made of a lightweight resin, the increase in weight from the larger objective　lens was minimized. This series was entirely waterproof. This Series of scopes which included two PROMINAR models was the perfect balance of compactness and high optical performance. It satisfied the wide range of user needs from beginning birdwatchers to scientists and professional researchers. This series had outstanding light gathering and deliverance. The　bright field of view made this the dream instrument of birdwatchers,　hunters, and target shooters throughout the world. High quality images are delivered in this user friendly, lightweight, 60mm scope with excellent cost performance. 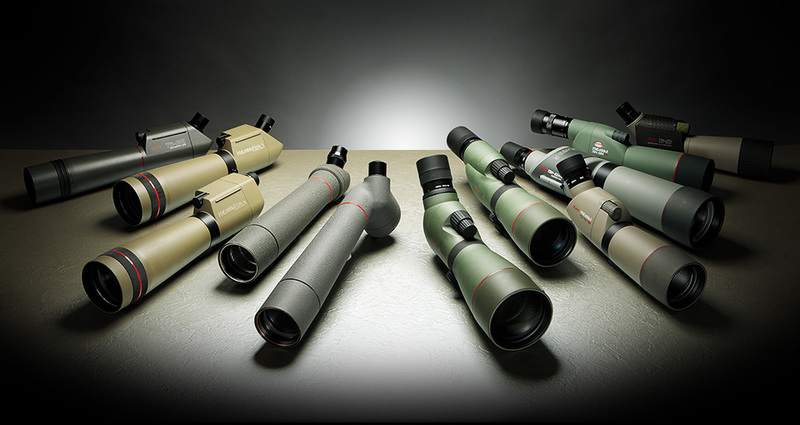 The flagship of Kowa's spotting scopes, this is the culmination of　over 60 years of spotting scope development. It's extremely large 88mm　fluorite crystal objective lens makes this a most sought after spotting　scope. A locking eyepiece, dual speed focus mechanism and superior optical　performance in a user friendly body leaves a very satisfying impression on　the user. A 77mm objective lens in a compact body. With the portability and compactness of a 60mm class scope and the optical performance of an 80mm class scope, this series will satisfy all levels of spotting scope users.